Learn to pray the “favorite prayer” of St. John Paul II in a whole new way. 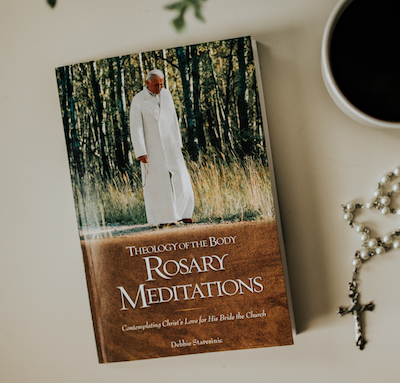 The rosary radiates new personal insights every time you pray it through the lens of Theology of the Body. This will become a meditative treasure and a beautiful gift for special family and friends when you invite them into this circle of love. (Save $2 per book now — see More Information). Who am I? What is my purpose in life? Jesus Christ, the Son of God, took on a body to answer these questions. Pope St. John Paul II developed this vision in his Theology of the Body. Praying the rosary through this lens illuminates what it means to be created male and female in the image and likeness of God. This book is ideal for individual prayer, prayer as a couple, and is even being used in community prayer in some middle schools. Our Lady encourages us to pray the rosary every day. This book, with beautiful illustrations and reflections for each mystery makes this time pure delight with our God. MAKE A GIFT OF IT! 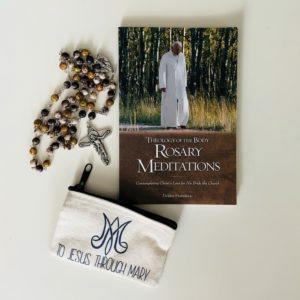 Order 6 OR MORE rosary books and save $2 OFF each book automatically. You are a gift! CALLING ALL BOOK SELLERS…Are you a book reseller with a Vendor’s License? Register your company here for your store’s wholesale discount on this title. Any rosary is a gift. This rosary is an absolute treasure. Our Lady of Fatima asked us to pray the Rosary every day. Our exclusive Theology of the Body rosary makes this daily blessing sensational. The first thing you'll notice is the weight of this fine rosary in your hand. Made in Italy, the Bohemian glass beads are fashioned in rich brown, tan and autumnal colors forming a perfect complement to the TOB Rosary Meditations book — finished with Theology of the Body inspired Unity Cross. Our Lady of Fatima asked us to pray the Rosary every day. 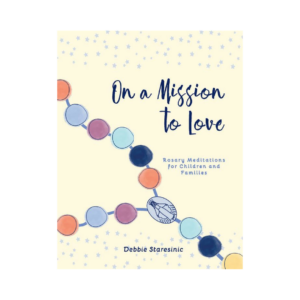 This book is designed to help classrooms and families like yours pray the Rosary every day with great joy and harmony. Inspired by the writings of Pope St. John Paul II, this book shares the beautiful truth of God’s plan for humanity. While meditating on the mysteries of the Rosary and the reflections in this book, children come to a deeper understanding of who they are and why God made them. On a Mission to Love makes a wonderful family gift! Any rosary is a gift. This gift for a child can ignite a lifetime of prayer. Our Lady of Fatima asked us to pray the Rosary every day. Our inviting Children's Rosary helps to start this daily devotion. 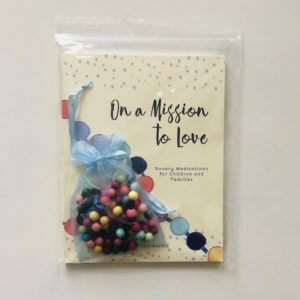 The colorful beads are a delight for children to hold and make tangible the On a Mission to Love family rosary experience. It is adorned by the Theology of the Body inspired Unity Cross — to inspire the mystery of the depth of God's love for each of us — and our appropriate response to receive it! This rosary is not a toy! To be used only under careful adult supervision.